Real Madrid were second best the whole game, largely because of Ajax’s fierce high press and quality on the ball. 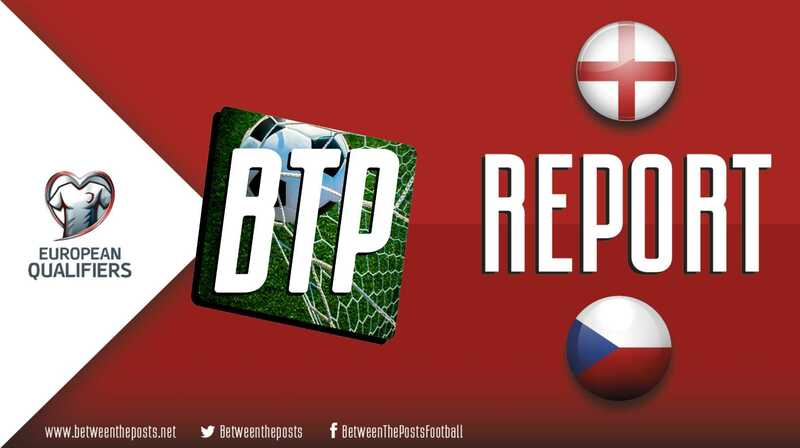 But the best team sometimes does not win in a game of football, and that was exactly the case in this intriguing Champions League round of 16 match-up. Ajax and Real Madrid could not have come into the Champions League round of 16 in more different veins of form. After a strong first half of the season, Ajax inexplicably collapsed in 2019. They drew 4-4 with Heerenveen, were smashed 6-2 by Feyenoord, and recorded a 1-0 loss to mid-table team Heracles Almelo in the five matches leading up to the resumption of the Champions League. In those games, Ajax’s organization was scattered and their counterpress After losing possession, a team immediately moves towards the ball as a unit to regain possession, or at least slow down the pace of the counterattack. collapsed, allowing opponents to eat them alive on the counterattack. For that reason alone, Madridistas had good reason to feel hopeful about progressing to the quarter-finals, as Santiago Solari and Real Madrid thrive when playing in a reactive stance. This was best seen against Real Betis, where Madrid used the Karim Benzema-Vinícius Júnior connection to fashion chances in transition. Madrid also executed a well-drilled high press that reduced the number of Betis’ final third The one-third of the pitch that is closest to the opposition’s goal. possessions and created additional counterattacking opportunities. Despite their issues and Real Madrid’s strength on the break, Ajax showed no signs of changing their philosophical approach. 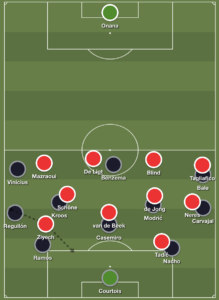 Indeed, manager Erik ten Hag started his gala eleven, signaling faith in his own possession-oriented 4-2-3-1 formation. André Onana played in goal behind a back line of Noussair Mazraoui, Matthijs de Ligt, Daley Blind, and Nicolás Tagliafico. In midfield, Lasse Schöne formed a double pivot 4-2-3-1 is one of the most frequently occurring formations in football. The two most defensive midfielders are called a ‘double pivot’. with future Barcelona player Frenkie de Jong. Ahead of them, Donny van de Beek played as the number ten, alongside wingers Hakim Ziyech and David Neres. Dušan Tadić started as a striker, regularly dropping into midfield. Other than the injured Marcos Llorente and Raphaël Varane, Solari was also free to pick one of his strongest lineups. Casemiro started in defensive midfield alongside Luka Modrić and Toni Kroos, while Nacho Fernández replaced Varane in defense. The attack was made up of Vinícius, Benzema, and Gareth Bale. The biggest weakness in Solari’s reign has undoubtedly been the disappearance of the all-time great press resistance This is an increasingly important trait in midfielders and defenders, particularly in teams playing a possession style of play. It refers to the player, or team, under pressure being able to keep possession and even bring the ball further up the pitch through dribbling or passing. seen under Zinedine Zidane. It was the reason Madrid were smashed by Eibar back in late November and why their performance against Betis was only good, not excellent. 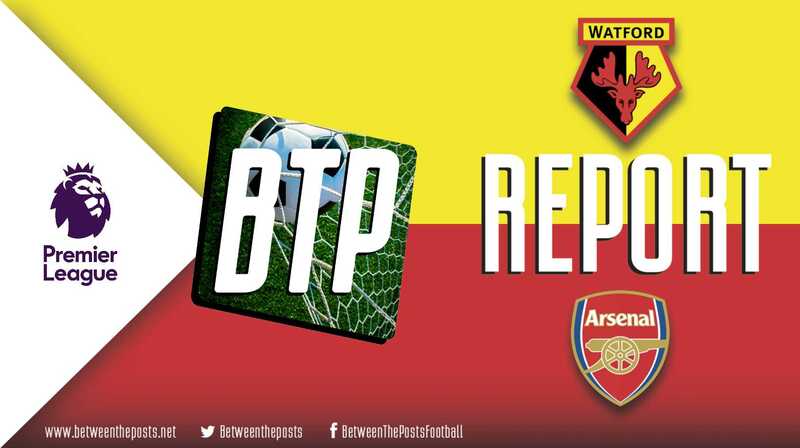 There have been some improvements over the past eight or nine games in this regard; there is a greater willingness to interchange positions in midfield and the fullbacks have looked to make dynamic infield runs after passing the ball to the wing. 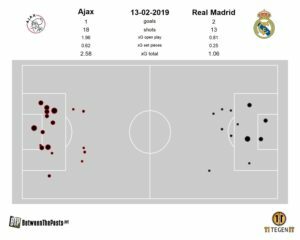 However, Madrid’s build-up structure has remained generally rigid and predictable over that span of time and, today, Ajax took advantage. When Madrid built play from the back, center-forward Tadić would sit in-between Nacho and Sergio Ramos while Ziyech and Neres hung around the spaces between Madrid’s center-backs and fullbacks. Behind them, Ajax’s midfield naturally matched up man-to-man against Casemiro, Modrić, and Kroos, thanks to ten Hag’s 4-2-3-1 shape. To finish it off, fullbacks Mazraoui and Tagliafico would stick close to Vinícius and Bale while one of de Ligt or Blind stayed on Benzema’s heels. When Nacho or Ramos passed the ball to the wing, Tadić would start the press by rushing onto the center-back who had given up the ball. Either Neres or Ziyech would then press the near side fullback, while the far side Ajax winger would mark Madrid’s far side center-back. Ajax’s high press suffocating Real Madrid’s build-up. The application of the press was close to perfect for basically all of the first half. Donny van de Beek, de Jong, and Schöne, won the majority of their duels in midfield, Neres and Ziyech took turns giving Dani Carvajal and Sergio Reguilón no breathing time on the ball, and de Ligt and Blind always made Benzema uncomfortable when he received with his back to goal. Solari’s easy-to-neutralize build-up was not helped by Casemiro, who has always been the weak link in regard to Madrid’s press resistance. He recorded a pass success rate of only 81% in the first half and lost the ball on six occasions – from dispossessions and bad touches – throughout the whole game. Of all the times to lose defensive midfielder Llorente to injury, this was surely one of the worst. Ajax’s press allowed them to dominate possession for periods in the first half. 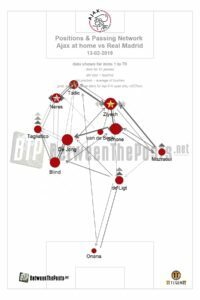 When on the ball, they attacked Madrid in their typical 2-2-5-1/2-2-6 structure; Ziyech and Neres drifted into the halfspaces If you divide the field in five vertical lanes, the halfspaces are the lanes that are not on the wing and not in the center. Because there is no touchline like on the wing, players have freedom to go everywhere. But this zone often is not as well-defended as the very center. This makes it a very valuable offensive zone to play in and a lot of chances are created by passes or dribbles from the halfspace., the fullbacks kept the width, and van de Beek joined Tadić up front. 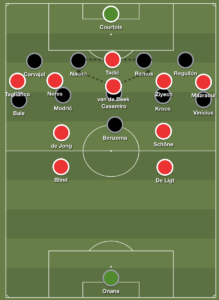 The number of options between the lines and the width of the attacking line pinned Madrid’s midfield into a passive stance, allowing plenty of time for de Jong and Schöne to pick out vertical passes or spray the ball wide. As a result, Ajax got into plenty of great attacking situations but often lacked the final ball. Even when they did manage to find a player in a shooting position, Ajax lacked clinicality, which was best seen when Ziyech missed a one-versus-one opportunity in the 35th minute. They thought they had scored off a corner only moments later, only for VAR to rule it out for offside, thereby ending the half at 0-0. The second period of play saw Madrid pass the ball with a little more confidence and retain more of the ball, though Ajax still looked to be the far superior team. Then, in the 60th minute, Vinícius made a run off-the-shoulder of the defense and expertly controlled a Reguilón lofted pass. Vinícius followed up his sweet first touch by eviscerating Mazraoui off-the-dribble and by cutting inside another defender to set up Benzema in time and space. The French forward made no mistake and finished in the top corner to put Real Madrid in front. 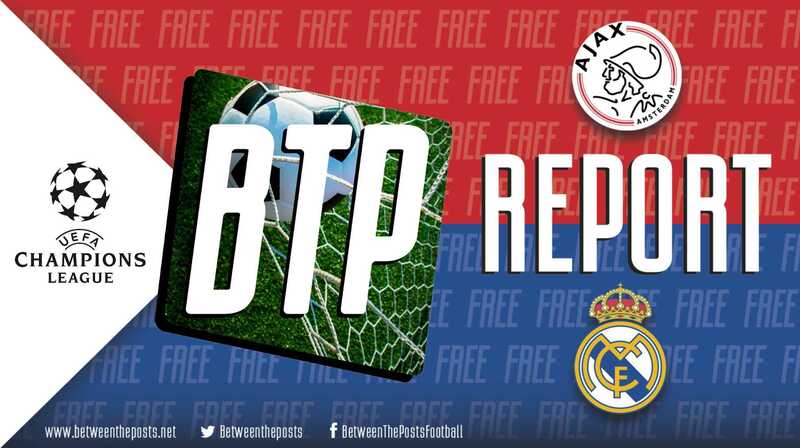 The goal did not seriously alter the dynamic of the game, as Ajax continued to be positive and Madrid’s press resistance issues remained unresolved. Solari, likely anticipating that this would be the case, made a defensive substitution by bringing off Bale for Lucas Vázquez immediately after the goal. The change would prove to be a mistake, as Lucas’ inferior press resistance – relative to Bale – led to Madrid conceding; he was dispossessed in a move that resulted in Ziyech scoring in the 75th minute. The goal seemed to indicate that luck was finally on Ajax’s side, until Ziyech lost a fifty-fifty duel only minutes before full-time. The resulting dominoes saw Casemiro play Carvajal into space down the right, with Neres failing to adequately track the Madrid right back. A great number of black jerseys flooded forward on the counterattack and Asensio tapped home a superb Carvajal cross to win the game. There was a possible foul in the buildup to the winner, as Lucas Vázquez clearly tackled de Jong to the floor on replay, but the referee decided not to check VAR since he had not clearly seen the incident in live time. After this, Ajax had a genuine chance of pulling the score level, when thirty seconds before the final whistle, Neres played a through-ball for Kasper Dolberg, the substitute striker. The young Danish attacker partly slipped when he attempted to shoot the ball past Courtois, which meant the shot was stopped and the game ended with a final score of 1-2. How Ajax avoided Real Madrid’s high press is an interesting tactical tidbit that must be addressed. As touched on before, Solari’s high press was a big reason for his side’s victory against Real Betis. So why was it not a factor today? For one, Ajax were simply too good building out from the back. The quality of passing was high and the likes of Frenkie de Jong constantly evaded their opponents’ cover shadows When a player is positioning himself between the opponent that has possession of the ball and another opponent, he is blocking the passing lane. When applied the right way, his ‘shadow’ is effectively taking the opponent in his back out of the game, because the pass can not be played. to enable ball progression. Secondly, goalkeeper Onana sometimes elected to blast the ball upfield, where Dušan Tadić did a brilliant job to hold up play and ensure that Ajax retained possession. Madrid were thus unable to prevent Ajax from accessing the final third and were constantly put under siege. There is no way around it – Real Madrid got lucky. They gave up plenty of chances, had their tactical weaknesses exposed, and created very few quality chances themselves. Nevertheless, luck is an inevitable part of (knockout) football and the truth is that Madrid were also far more clinical than their opponents. That does not mean that anyone should be happy about the performance, but the 2-1 lead is a great platform from which to start making improvements. Ajax should be proud of themselves. They shook themselves out of a rut, played with passion, and executed ten Hag’s tactical plan to near perfection. The only thing that will haunt them is their inefficiency in the final third, and that may well be enough to prevent them from reaching the Champions League quarter-finals.